The "Big Bang" occurred at the left side of the image. I found a posting on an online chat linked to the website www.deism.com. I checked it out. It is sponsored by the World Union of Deists. Below the title on their home page is the statement, "God Gave Us Reason, Not Religion." The top link in the menu on the home page is: "Deism Defined." "Deism is knowledge of God based on the application of our reason on the designs/laws found throughout Nature. The designs presuppose a Designer." "... acquaintance with facts, truths, or principles, as from study or investigation; general erudition." "... belief in The Supreme Intelligence/God that is beyond a reasonable doubt, as this legal phrase is defined in Federal Judicial Center, Pattern Criminal Jury Instructions (1987)." "... proof that leaves you firmly convinced." They acknowledge that there are "... very few things in this world that we know with absolute certainty." Most of the monotheistic religions in the world teach that God revealed moral, ethical and religioius teachings to humans through revelation. However, most Deists believe that once God created the universe, including its laws, and set it in motion, God then disengaged and hasn't been involved in the universe since. Development of religious, ethical, and moral criteria are a human activity and responsibility. "If you are walking along in the desert and pick up a watch that was lost, even if you have never seen a watch before, you will know that it must have been intentionally made by an intelligent Being. Since our world functions so perfectly, all the parts fit together and work in unison, there has to be an intelligent designer behind the design of our Universe and that designer is God." This reminds me of the 1980 movie called "The Gods Must Be Crazy." 3 It was about an aborigine in a remote African desert who found an empty Coke bottle in the desert. It had fallen from a plane. The villagers wondered what it was for, and fought over it. But I digress. The argument doesn’t prove that an Intelligent Designer still exists and is currently active in the Universe. God could have lit the fuse that set off the Big Bang and then stepped aside to let things develop on their own terms. It is also possible that it was God who went BANG in the Big Bang. He may have blown himself up with the strain of creation. All his gazillion God bits may have seeded the current Universe. The biggest problem is jumping to the conclusion that because things LOOK like they were designed by an Intelligence that there actually was such an Intelligence at work. From what we have learned about evolution and the physics of matter we know that no such Intelligence was needed to account for the order that we see in the universe. 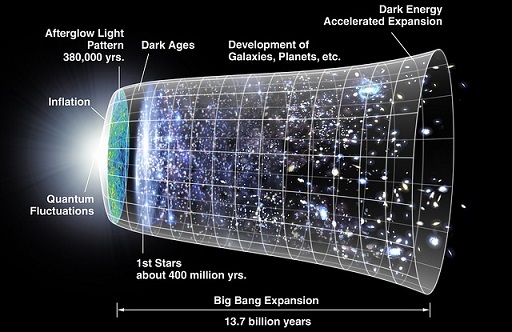 The physical dimensions involved at the start of the Big Bang were so small that the laws of quantum mechanics ruled. They allow for matter to spring into existence uncaused, from nothing, without a creator. There is plenty of information on the Internet that discusses this. I suggest that people educate themselves about evolution, and about the physics behind the Big Bang. One good book to look for is "A Brief History of Time " by Stephen Hawking (1942-2018).4 It was written by a physicist but it is comprehensible by people with a basic scientific understanding. However, those who have very little understanding of science will find it difficult if not incomprehensible. Other folks might know of other books that they would recommend, we’d like to hear about them and why you recommend the book. The second essay on the deism.com website is Deism vs. Atheism and Christianity. Their essay contains a section titled Deism VS. Atheism. The writer quotes an argument from Thomas Paine to prove that God exists. "The universe is composed of matter, and as a system, is sustained by motion. Motion is not a property of matter, and without this motion, the solar system could not exist." The bold emphasis above is mine. The argument continues and concludes with the position that there must be a prime mover responsible for all the movement in the Universe and the prime mover is God. This argument is connected to a position stated by Descartes that the sole essential property of matter its length, breadth, and depth which occupies space. The first problem with Paine's argument is that we know more about our Universe and the properties of matter and motion than he or Descartes knew. Using their statements as the basis of a modern day argument presents problems. Thomas Jefferson is also quoted later in that essay. All arguments are only as good as their initial proposition and this proposition “Motion is not a property of matter” is simply wrong. Speaking as a non-physicist, there are two forms of matter, animate and inanimate. Motion is a property of animate matter, in fact it is one of the properties that separates animate things from inanimate things. Matter is defined as material substance that has mass and occupies space. Matter can appear as a solid, a liquid or a gas. Motion means a change of position or place, movement. Animate means to give life to, make alive, make lively, or vigorous. We know that living organisms are self-propelled. There is no great puppeteer in the sky pulling strings to move my limbs. When I decide it is time to get a move on, I fire up my muscles and move. Someone might try to argue that there is something that got me to move, that the motion was caused by an outside force. Here the person is confusing influence with control. If I meet a bear in the woods, that bear will influence my decision to turn and walk the other direction, or to run, or to climb a tree. BUT it is my own muscles and will that perform/control the action. Giant oak and redwood trees, move nutrients from the ground to the tips of their highest branches. They require no outside force -- manning the pumps, so to speak -- to move those nutrients. Motion, the movement of nutrients and chemicals through their system is vital to their survival. Radioactive matter continually sheds radioactive particles. That shedding or loss of particles is motion, the movement of the particle from the main mass into the air. This Deistic argument for God’s existence fails before it gets going because of a faulty initial premise. What about inanimate matter? Is motion a property of inanimate matter? Or does inanimate matter (rocks, tables, and chairs for example) require a great puppeteer to move things and keep them in motion? I have explained in other essays that all matter is made up of energy. All matter is made up of chemicals, those chemicals are composed of those atomic elements from the Periodic Table of the Elements we learned about in High School chemistry and those elements are composed of those subatomic energy particles that spewed out at the Big Bang. At the atomic level, matter is always in motion, there are electrons whirling around nuclei. We just can’t see them. So motion is an integral property of all matter, animate and inanimate. Early philosophers (Thomas Paine, Thomas Jefferson, Descartes) can be excused for not understanding the nature of motion and matter but modern Deists that claim they base their beliefs on reason and knowledge can’t. My opinion is that they will have to come up with better arguments, IF that is, they want to prove beyond a reasonable doubt that God exists.